(Newser) – Researchers in Hawaii have been absorbed by a sea creature they discovered last summer, and their findings are pretty big. 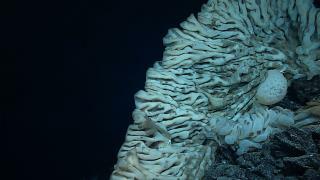 The team of scientists on a deep-sea expedition in the waters off Hawaii discovered what they say is the world's largest known sponge. The creature, roughly the size of a minivan, was discovered about 7,000 feet down in a marine conservation area off the shores of the Northwestern Hawaiian Islands, the AP reports. The rare sponge, with a bluish-white color and brain-like appearance, stunned scientists when it appeared in the remote cameras attached to their underwater rover. The team took samples of a sponge of the same species they found the day before and sent them to the world's top experts, and no one could identify what genus the sponge belongs to. It might make a fine mattress.